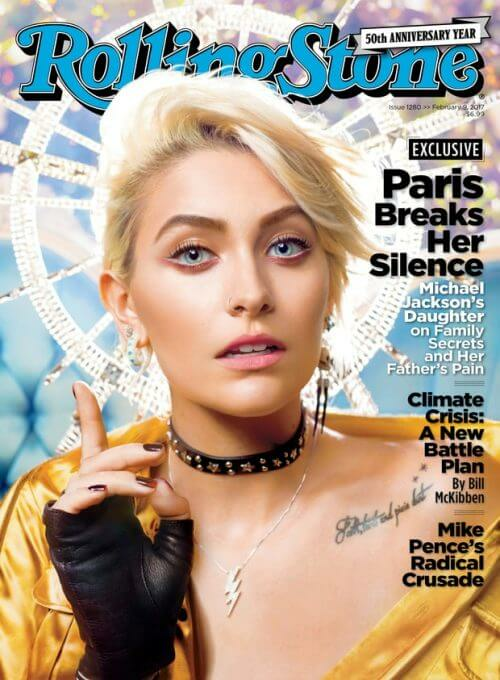 Michael Jackson was murdered by the Illuminati, according to his daughter Paris Jackson, who also claims she has “proof” the secret society was behind his death. In an interview with Rolling Stone Magazine, the 18-year-old daughter of Michael Jackson claimed her father knew that a group “more powerful than the government” was planning to kill him – and that he was eventually murdered in a “setup“. “He would drop hints about people being out to get him. And at some point he was like, ‘They're gonna kill me one day’,” Paris said. Paris is pointing the finger at the Illuminati, popularly believed to be controlling the music industry and much of Hollywood. “It's obvious. All arrows point to that. It sounds like a total conspiracy theory and it sounds like bulls***, but all real fans and everybody in the family knows it. It was a setup. It was bulls***.” Paris was 11 when her father died from cardiac arrest in 2009 caused by a lethal combination of prescription drugs. Michael Jackson's personal physician Dr Conrad Murray was convicted of involuntary manslaughter and sentenced to four years in prison. Paris blames Murray for her father's death but claims he was a pawn used by the sinister organization behind the plot on her father's life – and she says she has proof. “I definitely do, but it's a chess game. And I am trying to play the chess game the right way. And that's all I can say about that right now,” she said. Paris, pictured with her father Michael in 2005 in London, said he would often drop hints that a group “more powerful than the government” were out to get him. We have talked before about the U.S. Government's secret mind control program named MK-ULTRA. The program had its tentacles in the music industry, and many believe the Illuminati had their sights on Michael Jackson for a long time. An ex-government agent has even come forward claiming that he was part of a plot to kill The King of Pop himself. As now confirmed by his daughter Paris, Michael Jackson knew about the plot on his life, and hours before his death told his former manager that a group of people wanted to get rid of him, saying “It's not the government, it's more than the government”. He disappears after rumblings of an unrecognized voice. The next day he is found dead and his doctor, Conrad Murray, is arrested for administering lethal doses of profanol. LaToya Jackson, has repeatedly lobbied the claim that there were other forces at bay. Murray, she says, was the fall guy, and there were people controlling him and everything he did. Ultimately she believed ‘they’ killed him. But we don't know who “they” are. The well-formed theory is that ‘they’ whenever ‘they’ are referred to are the Illuminati. The Illuminati are believed to be a society that have roots in the 18th century but are still believed to exist, infiltrating powerful institutions to control the population at large in preparation for the New World Order. They are popularly believed to be controlling all major musicians and in some cases Hollywood. In the video, actor Randy Quaid believed that they were out to get him, discredit him and even kill him. “Star whackers” he says, are responsible for killing Heath Ledger, Chris Penn and David Caradine. Many still believe there was more to Michael Jackson's death, and let's face it miscarriages of justice are not exactly uncommon in the US of A, but we're still waiting out on exactly who ‘they’ are.